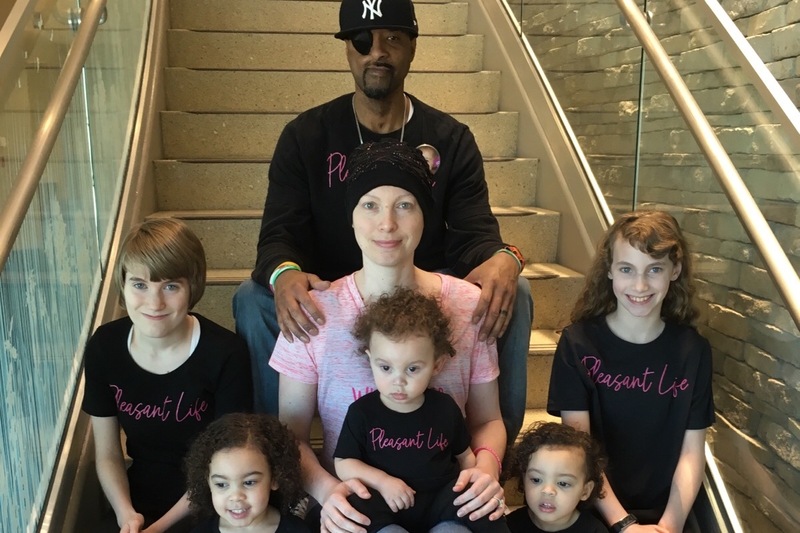 #PleasantLife: Husband and Wife Team Up to Battle Cancer! Where does one begin when telling the story of our family? Cancer is no stranger to the Pleasant Family. In 2005, Jerome was diagnosed with Osteosarcoma of the jaw; at the age of 26. The tumor inside his mouth had grown so large that the doctors decided that chemotherapy was needed before surgery. And so began his first battle with cancer. Jerome would go on to have skin grafts, bone grafts, removal of his teeth, removal of his cheek bone, removal of his jaw bone, his palate, reconstruction surgery that failed, and more chemo and radiation. The doctors removed a section of bone from his leg to reconstruct his face, only to have it fail and have to be removed. Radiation to the face damaged his right eye and he now is completely blind on that side. A tracheotomy had to be put in place for the surgery which damaged his vocal chords and his voice never recovered. The doctors worked hard to save his life and they did. Until 2010, when the cancer returned; this time has a Glioblastoma of his brain. And so this time, brain surgery was required to remove the lesions. They removed a section of his skull and replaced it with a metal plate. To this day, his hair has never grown back in that spot. Things were looking up until in 2012 when another Glioblastoma was discovered. Another brain surgery was performed but this time chemo and radiation were not needed. In total, Jerome has had over 21 surgeries in his battles with cancer that have left him disabled. In 2016, Jerome began having seizures that were not able to be controlled despite being put on medication. The doctors think this is a result of the damage done to his brain and this will be an ongoing condition for the rest of his life. In 2018, he was diagnosed with Epilepsy and told he would never be able to work, etc again. Despite all of this, Jerome remains a positive outlook on life and his spirit touches all that he comes across. Cancer may have took a lot of things from him but never his heart. 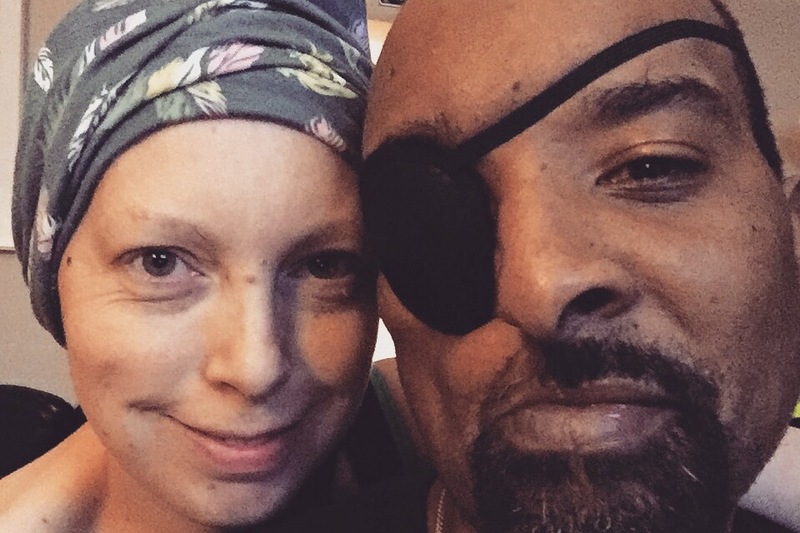 And now it seems cancer wants to try again with this family, this time with Jerome’s wife, Amber. On June 3, 2018, Amber discovered a lump under her left arm while feeding their son. Breast Cancer runs strong in her family as her great-grandmother, grandmother, mother, aunt and great-aunt have all had Breast Cancer. Amber immediately called her OB/GYN who ordered a mammogram and sonogram to be completed. The sonogram revealed a tumor and 3 lymph nodes affected. A needle biopsy was completed by a breast surgeon who confirmed a diagnosis of Stage 2 Invasive Ductal Carcinoma. Amber will be starting chemotherapy on July 16, 2018 and it will continue for a year. Her Bi-Lateral Mastectomy surgery is scheduled for Thursday, December 6, 2018. Radiation will begin 6 weeks after surgery in early January 2019. Amber is only 37 years old and is the youngest of her family to be diagnosed. And although everyone in her family is BRCA 1, BRCA 2, and BART negative; the doctors feel there must be some genetic mutation in this family that has yet to be discovered. The Pleasant Family has a lot on their plate. The couple has 6 children in total, ages 17, 15, 10, 3, 2 and 9 months. Another cancer diagnosis is the last thing they need right now. Because of Jerome’s Epilepsy diagnosis, he is not allowed to work. 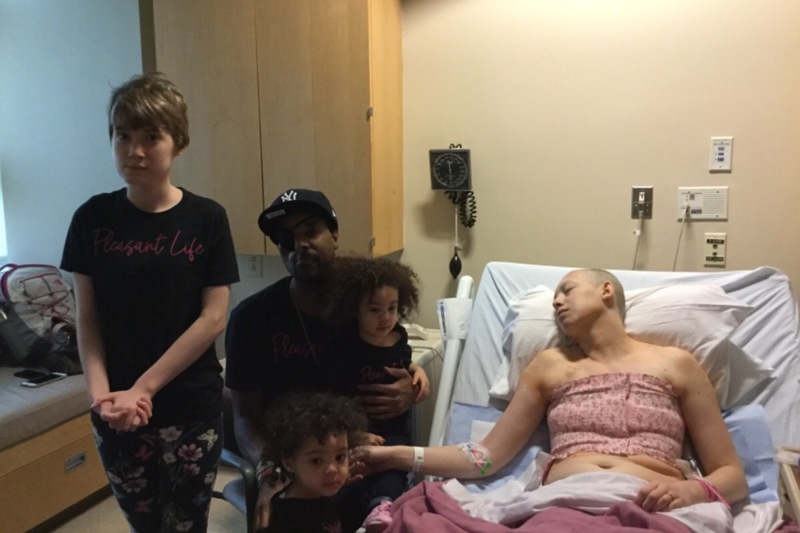 Amber has been working to bring income in for the family during this process and it is unclear if she will be able to continue while fighting her battle. This GoFundMe has been set up to help alleviate the financial burden this family has and will continue to endure. Medical expenses are a big concern for the family as both husband and wife try to beat the odds. Jerome’s medical team is at the University of Maryland in Baltimore and Amber’s medical team is at University of Maryland Upper Chesapeake. Gas, tolls, and parking will be something the family will need help with as well. Thank you for supporting the Pleasant Family during this difficult time! The screening process for Li-Fraumeni requires quarterly MRI’s, bloodwork, and sonograms of the abdomen. This is the regime that Jerome has been following since he was diagnosed. In October, Jerome’s MRI discovered a tumor in his skull. 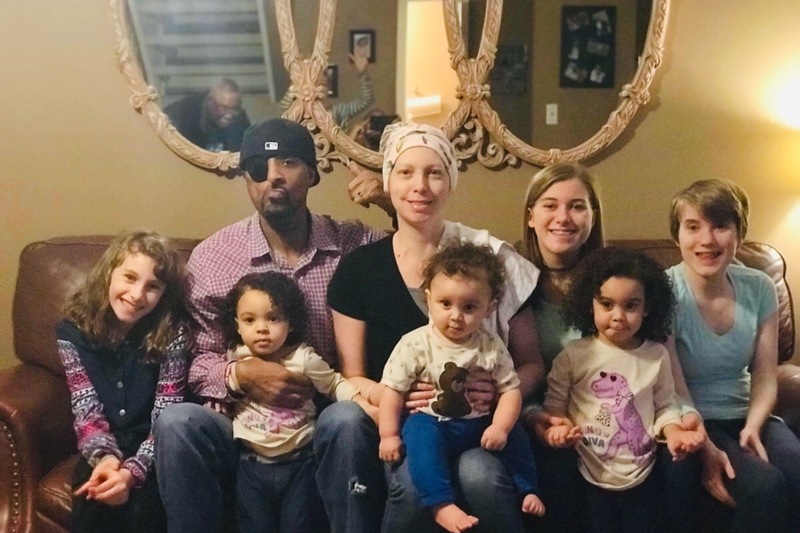 Because Amber was undergoing TCHP chemo and preparing for her Double Mastectomy, Jerome’s oncologist suggested they monitor Jerome until Amber was strong enough for him to have surgery. The most recent scan shows the tumor at 18 mm and surgery has been scheduled for the week of March 18th. Jerome will have to stay overnight in the hospital and will be having a craniotomy biopsy. It will take a few weeks to get the results of the biopsy. On Wednesday March 13, 2019, Amaya and August had their first full body MRI to begin their screening process. August MRI came back clear. Amaya’s MRI shows a tumor in her pelvis. Her MRI report reads: “Well-circumscribed mass in the upper left hemipelvis measures 3.3 cm x 3.6 cm x 3.0 cm (AP x TV x CC) and is T1 hypointense and heterogeneously T2 hyperintense. It causes mild mass effect on the left psoas muscle and splays the left common iliac artery and vein but does not invade or encase any surrounding structures. It abuts the left ovary but does not appear to arise from it. Otherwise, the abdomen and pelvic organs are unremarkable.” Her surgeon has requested another sedated MRI this time with contrast. In order to save the family multiple trips to the hospital, Amaya’s MRI has been scheduled for the same day as Jerome’s surgery. Amaya’s surgery has been scheduled for the week of March 25, 2019. The family will continue to update Amber’s Facebook page ( https://m.facebook.com/AmberLPleasant) with results as they move through the next few weeks. Any donations they receive will help go towards gas, parking, tolls, and meals back and forth to University of Maryland in Baltimore and University of Maryland Upper Chesapeake. The family thanks the staff at both hospitals for their overwhelming support and accommodations that they’ve made to support the entire family. 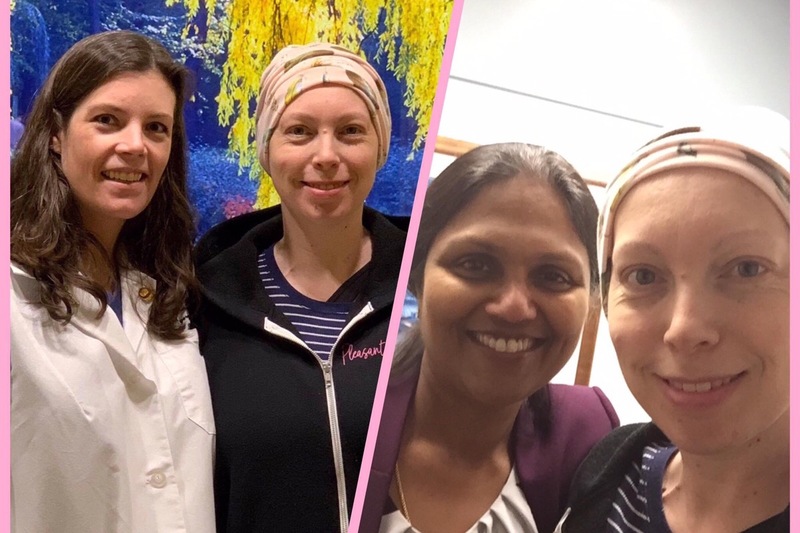 Amber’s Bi-Lateral Mastectomy Surgery was on December 6, 2018. She is recovering well from surgery and has suffered zero complications so far. She has opted out of reconstruction surgery. On December 14, 2018, the full pathology report from the surgery revealed that both breasts & the 8 lymph nodes that were removed and biopsied should no evidence of disease. Amber had a complete response to chemotherapy and is cancer free! Amber will meet with the Radiation specialist on Friday, December 21, 2018 to determine if she will still need to complete radiation treatment or not. Chemotherapy started back up on Monday, December 17, 2018 and there are 10 more rounds of chemotherapy to complete! Thank you again for helping our family during this difficult time! November 28, 2018- After spending the past 2 days at University of Maryland for post operative appointments and tests, we have the green light on surgery next week; Thursday, December 6, 2018 at 6 am. And, even though there may be choppy waters surrounding our family; I have a huge sense of peace when it comes to this surgery. Normally when it comes to this kind of stuff I’m an emotional wreck and full of anxiety. Sure, I’m scared but I’m more worried about Jerome and the kids during my recovery process than anything. Not being able to help him or hold my babies for several weeks is more upsetting than loosing my breasts. I have to believe that my sense of peace comes from several sources but the number one reason is God. My faith and spirituality have grown so much during this season of life. It’s ironic how much things change when you are literally fighting for your life. And, when you understand that only 1 person can save it, a shift starts to happen in your life. Praying circles around my cancer and our situations in life has replaced worrying in circles. I’ve learned that all nighters with God are more valuable than all nighters with fear. I still have my moments where the devil tries to creep in but I am very proud of myself on how far I’ve come with my anxiety. The book “The Circle Maker” by Mark Batterson has changed my life forever, and I highly recommend it. My sense of peace also comes from the medical team that has from Day 1 provided me the best care possible. The entire staff at The Kaufman Cancer Center has been working hard to keep me alive and I am beyond thankful for the level of care I have received. Pictured here is my Breast Surgeon, Dr. Milburn and my oncologist, Dr. Sivasailam. These 2 women have made this journey a lot easier and I trust and respect them so much. And finally, I know my husband and all the individuals who are working behind the scenes to help our family are another reason I’m at peace with surgery. Thank you for all that you are doing to prepare us for the next few weeks AND make sure our family has a nice Christmas as well. 11/13/18- I’ve been thinking all day about how I can put into words what happened today. This morning, I returned to Advanced Radiology for a Breast Sonogram to see how I responded to chemotherapy before my surgery. This was the first time my breasts were scanned since I was diagnosed in June. Sitting in the exact room I was diagnosed in was very emotional for me. It was hard not to tear up and think back to that day and how much our lives have changed since June 8th. As I laid on the same table watching the tech scan me and ask me the same questions, tears started rolling down my face. I watched the tech walk over to a different computer and pull up my previous sonogram. As the video played back, she showed me where my tumor was and the lymph nodes that were affected. And then, she showed me my scan today...and there was one difference. Today, the scan showed a COMPLETE RESPONSE to the chemotherapy. Where the screen was once filled with a black area was now white. Where there once was a tumor, there’s no longer a tumor. Where there was once a huge peanut shaped lymph node, was now a little circle. She walked out of the room to show the doctor and I sat, once again, waiting for news. As she walked in the door with a huge smile on her face, I knew a miracle was upon us. “The doctor says you’ve had a remarkable response to chemotherapy and is pleased to give you good news!” I burst into tears and the tech just held me as I sobbed. I was also given the news that the MRI of the Brain I had last week showed no metastasis to the brain. And, the sonogram of my ovaries also showed no metastasis as well. Everything we’ve gone through since June 8th has been worth it. Every time I’ve gotten sick. Every needle stick. Every blood draw. Watching my hair fall out and lay at me feet in the shower. Shaving my head. Every one of the now 50 pounds I’ve lost. Every time I couldn’t get off the couch to make my family dinner. Every assignment I failed to complete for work. Every amount of pain I experienced from the Neulasta shot. Every penny that’s been spent to save my life. All of the sleepless night where I’ve cried out to Jesus to please let me live. Every prayer I’ve circled to get here. ALL OF IT was worth it. God keeps blessing The Pleasant Family and it’s all because of him that we are here praising his glory. THANK YOU JESUS FOR SHOWING US HOW AMAZING YOU ARE! And, thank you to all of you for your prayers as well!